Author Andreas Stolt et al. The video presents a framework for dual-arm robotic assembly of stop buttons utilizing force/torque sensing under the fixture and force control. This chapter introduces visual servo control, using computer vision data in the servo loop to control the motion of a robot. We first describe the basic techniques that are by now well established in the field. We give a general overview of the formulation of the visual servo control problem, and describe the two archetypal visual servo control schemes: image-based and pose-based visual servo control. We then discuss performance and stability issues that pertain to these two schemes, motivating advanced techniques. Of the many advanced techniques that have been developed, we discuss 2.5-D, hybrid, partitioned, and switched approaches. Having covered a variety of control schemes, we deal with target tracking and controlling motion directly in the joint space and extensions to under-actuated ground and aerial robots. We conclude by describing applications of visual servoing in robotics. 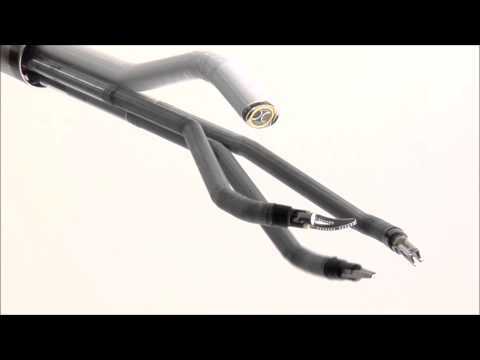 This video shows an IBVS on a 6-DOF robot arm with Cartesian coordinates of image points as visual features and a desired interaction matrix in the control scheme. It corresponds to the results depicted in Figure 34.2. 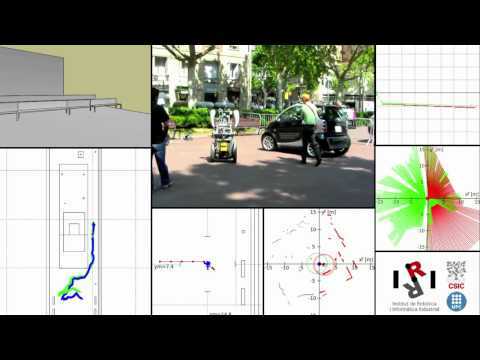 This video demonstrates a fully autonomous navigation solution for mobile robots operating in urban pedestrian areas. Path planning is performed by a graph search on a discretized grid of the workspace. Obstacle avoidance is performed by a slightly modified version of the dynamic-window approach. In human-robot cooperative tasks, the robot is required to memorize different trajectories for different assignments and to automatically retrieve a proper one from them in real-time for the robot to follow when any assignment is repeated as, e.g., when carrying a rigid object jointly by a human and a robot. To start the task, the human leads the robot along a suitable trajectory and thereby achieves the desired goal. For every new task, the human is required to lead the robot. During the process, the trajectories are recorded and stored in memory as "skillful trajectories" for later use. Reference: J.Y.S. Luh, S. Hu: Interactions and motions in human-robot coordination, Proc. IEEE Int. Robot. Autom. (ICRA), Detroit (1999), Vol. 4, pp. 3171 – 3176; doi: 10.1109/ROBOT.1999.774081. Simulation of Greg Chirikjian's binary manipulator grasping a cylindrical object. 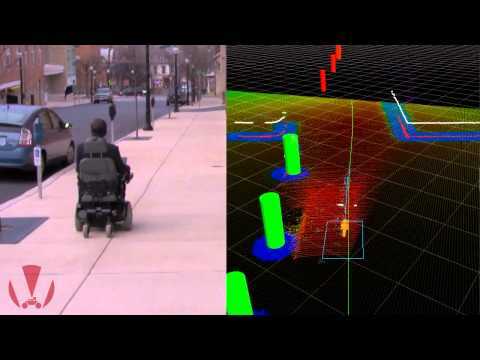 This video demonstrates the reliable navigation of a smart wheelchair system (SWS) in an urban environment. Urban environments present unique challenges for service robots. They require localization accuracy at the sidewalk level, but compromise estimated GPS positions through significant multipath effects. However, they are also rich in landmarks that can be leveraged by feature-based localization approaches. To this end, the SWS employed a map-based approach. A map of South Bethlehem was acquired using a server vehicle, synthesized a priori, and made accessible to the SWS client. The map embedded not only the locations of landmarks, but also semantic data delineating seven different landmark classes to facilitate robust data association. Landmark segmentation and tracking by the SWS was then accomplished using both 2-D and 3-D LIDAR systems. The resulting localization algorithm has demonstrated decimeter-level positioning accuracy in a global coordinate frame. The localization package was integrated into a ROS framework with a sample-based planner and control loop running at 5 Hz. For validation, the SWS repeatedly navigated autonomously between Lehigh University's Packard Laboratory and the University bookstore, a distance of approximately 1.0 km roundtrip. The goal of the research is to develop a framework and the support tools for the deployment of multiple autonomous robots in an unstructured and unknown environment, with applications to reconnaissance, surveillance, target acquisition, and the removal of explosive ordnance. The current state of the art in control software enables supervised autonomy, a paradigm in which a human user can command and control one robot using teleoperation and close supervisory control. The objective here is to develop the software framework and tools for a new generation of autonomous robots.